There’s a move afoot to tax wines made from 100% Canadian grapes, and the Canadian Vintners Association (CVA) isn’t impressed – neither are we. The European Union (EU), the world’s largest producer and exporter of wine, accounts for 50% of the Canadian market and its wine-producers are supported by over $2.3 billion in annual subsidies – support Canadian wineries currently don’t enjoy for either domestic or export production.However, the EU is considering WTO action against Canada over a small excise duty exemption that applies to only 5% of Canadian producers’ sales – an exemption currently also granted to domestic producers in the United States and Australia. 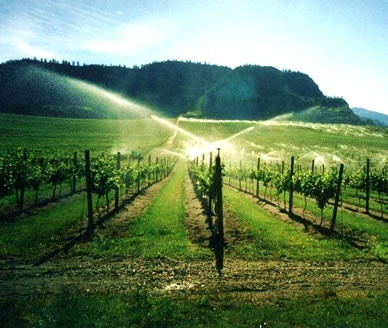 Above: watering the vines at Burrowing Owl, one of Canada’s many award winning wineries. Why the EU appears to be singling out Canadian producers and leaving both US and Aussie producers alone is anyone’s guess. But CVA president Dan Paszkowski believes many of Canada’s smaller wineries need this excise measure to help level the competitive playing field, so he’s launched a new website where Canadian wine lovers can log on and support the domestic wine industry. You can check it out for yourself at www.supportcanadianwines.com. – Initiating development of the first Canadian national quality standard for wine in 1996. – Advocating labelling regulations that are fully transparent and informative for the consumer, while being commercially acceptable to the wine industry. – Coordinating an annual export strategy for Canadian wine that has successfully obtained over $2 million dollars in export funding from the federal government over the past few years. – Initiated and reached agreement with Germany and Austria on an International Icewine Standard that played a fundamental role in enhancing Canada’s terms of access to the European Union. This entry was posted in wine and taxes and tagged Burrowing Owl, Canada, Canadian wine, European Union, Export, Food, United States, Wine. Bookmark the permalink.